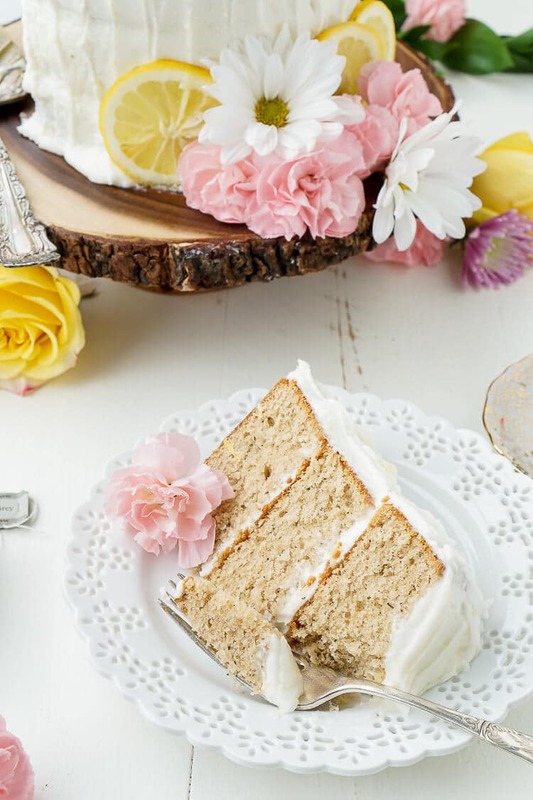 This Earl Grey Cake with Lemon Buttercream is the perfect afternoon dessert for tea lovers inspired by Alice Through the Looking Glass. I had wanted to go to Scotland for as long as I can remember, but I wasn’t going for the food, more for the rich history and gorgeous scenery, but after getting into Edinburgh, we were hungry and headed to the Elephant House where J.K. Rowling wrote the majority of the Harry Potter series. It was there that I became acquainted with Earl Grey Cake, and it was then that I fell in love with it too. I’m a huge fan of tea laced desserts like my Earl Grey Shortbread Cookies, but in a cake, it’s something else I tell ya. A bold beautiful flavor that reminded me of afternoon tea with my grandmother after school. 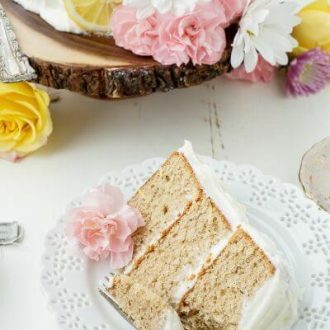 The cake in the cafe was served with cream cheese frosting, which was delicious, but for me, there’s no greater pairing than tea and lemon. The lemon buttercream is bursting with vibrant citrus notes thanks to the lemon zest and freshly squeezed juice. And when it hugs that Earl Grey Cake, it’s pure bliss. I thought this cake would make the perfect addition to any tea party and it’s the release of Alice Through the Looking Glass that finally encouraged me to make it! In a small saucepan, heat the milk and vanilla extract over medium heat until it begins to simmer, remove from heat and add in the tea bags, cover and steep for 20 minutes. Squeeze the tea bags to get all the liquid out and pour milk back into a measuring cup, add additional milk if necessary to get volume back to 1 cup. Let milk cool to room temperature. Once milk has cooled, preheat oven to 350 degrees F. Line the bottom of three 6-inch pans with parchment paper and spray with cooking spray and set aside. In a large bowl or stand mixer, cream together the butter and sugar until light and fluffy, add eggs one at a time, mixing and scraping down the sides of the bowl between each addition. In a large bowl, stir together the flour, baking powder, loose tea leaves, and salt. Add to the butter mixture alternating with the tea milk, starting and ending with flour. Mix just until flour is combined. Add 2 cups of batter to each prepared cake pan and bake for 30 to 35 minutes or until tops of cakes spring back when touched. Remove from oven and transfer to cooling rack to cool completely. In a large bowl or stand mixer, cream together the butter and zest, add confectioners sugar a cup at a time, alternating with the lemon juice and heavy cream, scrapping down the sides as needed. Whip on high speed until light and fluffy, about 3 to 4 minutes. If frosting is too soft, add a bit more sugar, if it's to stiff, add a little more heavy cream 1 tsp at a time. 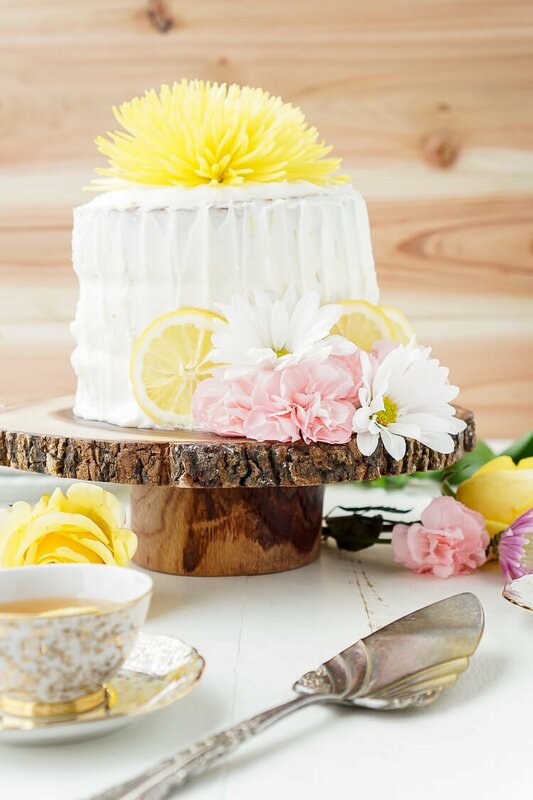 Place the bottom layer of cake on a cake stand and add a light coat of frosting over it, repeat with the next two layers, keep the crumb coat of frosting thin and place in the fridge for 20 minutes to chill. Remove and finish frosting the rest of the cake as desired. 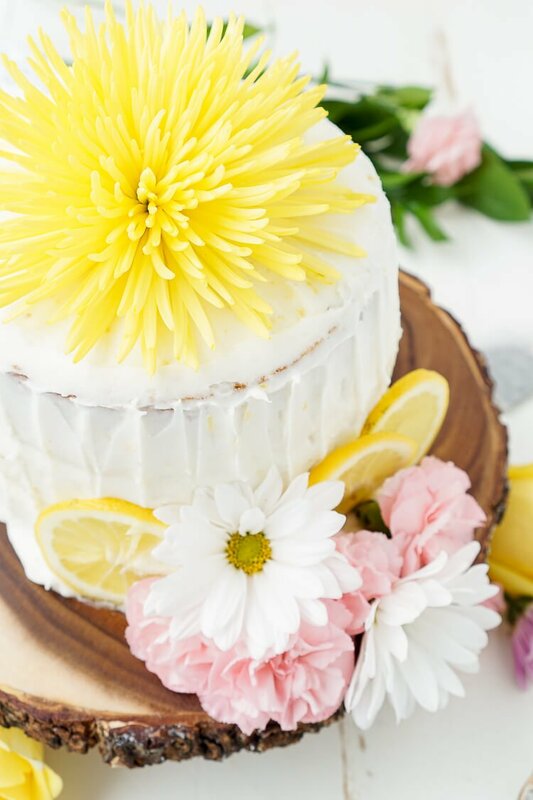 Garnish with fresh flowers and lemon slices if desired. Cake recipe slightly adapted from Sift and Whisk. Horrifically crumbly. I popped it out of the cake tin and it immediately fell apart. Such a lovely recipe! The flavor of the earl grey tea comes out perfectly, and it’s incredibly moist and delicious. I used a different buttercream but I think next time I will try the lemon, and maybe add a touch of lemon or orange zest to the cake batter. Not sure what the other comment about it being crumbly is about- mine was absolutely perfect! Thank you for posting this recipe! I’m so glad you enjoyed it, what flavor buttercream did you use? Amazing recipe! 🙂 I baked this cake for my sister to take to work (she works in a hospital) and she left it in the tea room for everyone to help themselves. She got plenty of praises by the end of the day and the cake was, according to her, DEMOLISHED! Thank you for sharing! Just wanted to say I made this for a birthday picnic and it came out so delicious!!!! The cake was very moist and the lemon complimented it perfectly. I added a little lemon zest to the sugar for the cake batter like Sallie suggested though I’m sure it would taste just as good without. Thank you for the recipe!!! So glad you enjoyed it, Aimee! Hi! I made this once and it was delicious! Could I add chopped nuts like pecans or walnuts to the recipe? Hi Salehha, I’m so glad you enjoyed it, I don’t think chopped nuts wouldn’t be an issue at all! The frosting says 2 tsp lemon and 5 Tablespoons lemon juice. What is the 2 tsp lemon? Extract? Rind? Hi Pamela, that should be zest, sorry about that! Will fix it now! 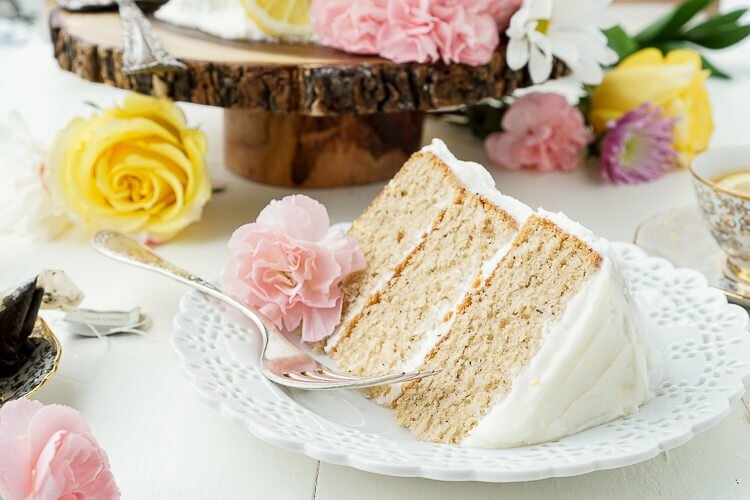 “Keep the crumb coat of frosting thin and place in the fridge for 20 minutes to chill.” — means to refrigerate the whole cake?. Once its fully frosted, do the cake need to be refrigerated? can i replace granulated sugar with castor sugar? if yes, any changes in measurements? Hi Phylicia, Yes, the whole cake should go in the refrigerator after the crumb coat is applied. The cake does not need to be stored in the fridge once complete, but it can be. It will last about 2 days at room temperature in an airtight container or 3 to 5 days in the fridge. As for castor sugar, you can generally use castor sugar instead of granulated in equal parts.